Great First Home or Investment! The home has now SOLD. 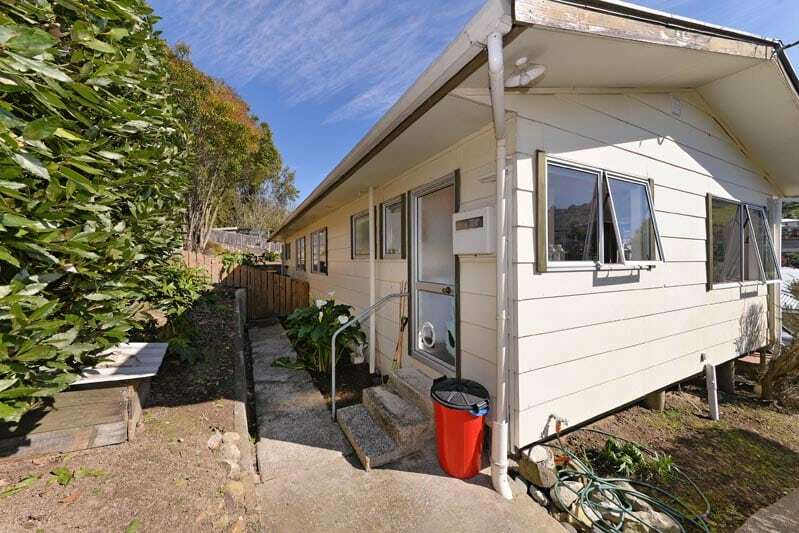 This two bedroom home is ideal as a first home or investment property. The upgrades in this home include new kitchen, new bathroom, new flooring and repainted throughout. Being nicely elevated gives the home a great outlook, creates privacy and most importantly gets it out of the valley floor and into the sun. The single garage underneath has plenty of storage space and there is off street parking as well. Being so close to the local shopping centre, Victory School, the Nelson Hospital and central Nelson this location is sought after and a great investment for the future. It is a must see for those looking for an affordable home or investment. It’s not a big home but neither is the price. Nelson City is the gateway to the Nelson and Tasman Regions. The oldest city in the South Island and 2nd oldest in New Zealand plus it is usually the sunniest spot in New Zealand. It has to be the best place to live! Nelson city has a thriving arts and music scene with festivals, studios, galleries and the famous Saturday Morning Market. Tahunanui Beach is a great spot and there is nearly always someone enjoying it, no matter the weather. Homes in Nelson range from the late 1800’s to today’s modern home. There are a couple of pockets of apartments plus many adjoining flats. The city is quite hilly and the flattest land area is an area called “The Wood”. With a population of greater Nelson (including Tahunanui and Stoke) of over 40,000 people it is a vibrant city with plenty of things to do and outdoor adventure playgrounds not too far away; Abel Tasman National Park, Marlborough Sounds, Nelson Lakes National Park, Kahurangi National Park (to mention a few). Nelson City is in a beautiful region surrounded by beaches & mountains, vibrant townships & lots of friendly people. Overall, a great place to call home. Have questions about 4/80 Toi Toi Street, Nelson or want to organise a private viewing? Please get in contact with Brent Palmer today. If you think Nelson is the perfect place to find your new home, let’s get together and I will answer any questions you may have. I’m here to help. About the Author: The above information on 3/80 & 4/80 Toi Toi Street, Nelson was written and provided by Brent Palmer, a local leader in the field of Richmond and Nelson Real Estate sales, marketing, advanced technology for home selling, and social media. You can contact Brent Palmer here, or at 027 544 9921. He has helped many people buy and sell homes in the Nelson, Stoke and Richmond areas for years, and would love the opportunity to help you as well. Thinking of selling your home? I have a real passion for helping people sell their homes in our Nelson and Tasman Region, as well as the marketing, social media & advanced technology for home selling that goes along with it. I’d love to have the opportunity to sit down with you discuss how we can work together to get you the best price. I help people buy and sell real estate in the following Nelson and Tasman towns & neighbourhoods: Wakefield, Brightwater, Hope, Appleby, Redwood Valley, Mapua, Stoke, Tahunanui, Atawhai and of course, Richmond and Nelson City. Connect with Brent on Facebook and pretty much everywhere else. Know someone who needs help with real estate?